A 6-month-old infant presented with a longstanding persistent cough, episodic spells of shortness of breath, gasping-like efforts after feeding, and an unusual noise while breathing, and was reported to have turned blue on two occasions after feeding. 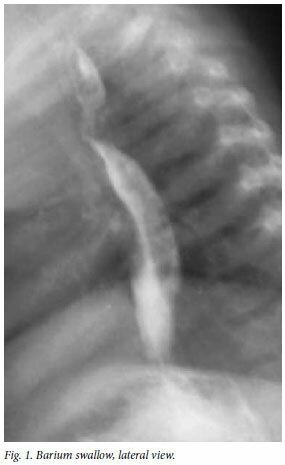 A chest X-ray showed significant narrowing of the trachea 2 cm above the carina. An upper gastro-intestinal study (Fig. 1) showed anterior bowing and extrinsic compression of the posterior wall of the oesophagus at the mid-thoracic level, and the trachea was narrowed and showed anterior bowing. The differential diagnosis included an aberrant right subclavian artery, and a double aortic arch was suspected. 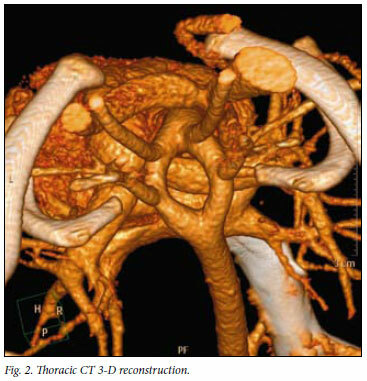 A thoracic computed tomography (CT) angiogram (Fig. 2) confirmed the presence of a vascular ring created by a double-sided aortic arch with compression of the trachea and oesophagus. Dr Seedat is a registrar in the Department of Radiology, University of the Witwatersrand, Johannesburg. Professor Andronikou is affiliated to the Department of Radiology, University of the Witwatersrand, and is President of the College of Radiologists of South Africa. Professor Modi was Head of the Department of Radiology, Chris Hani Baragwanath Hospital, Johannesburg, at the time of writing and is affiliated to the Department of Radiology, University of the Witwatersrand. Dr Lorgat is a paediatrician in private practice at Lenmed Clinic, Johannesburg.